Your mindset can truly make or break you. Choosing to be happy, work hard, focus on the positive things in your life and enjoy the little things can be a recipe for success. On the other hand, living with a negative mindset can bring you spiraling down. If you’re struggling with being successful, your negativity might be to blame. A successful person knows that hard work comes before true success. In order to earn something, you have to be willing to work for it. Life isn’t fair. Another person may get a raise before you do. You might get a flat tire while driving to work. You might get stuck with a late fee after forgetting to pay a bill. While others are solely interested in complaining and playing the victim, a successful person is busy looking for a solution to the problem. Too often, we find ourselves doing a job we didn’t necessarily sign up for. But when a successful person is asked to do something extra at work, they never respond with “that’s not in my job description.” Instead of being negative, they find a way to make it work. They prioritize, ask questions and offer a positive, helpful attitude. Being a team player can be just as important as solo work when it comes to being successful. Using phrases like “I can’t” or “that’s impossible” are self-limiting. They can cause others to perceive you as pessimistic or unwilling to work hard. 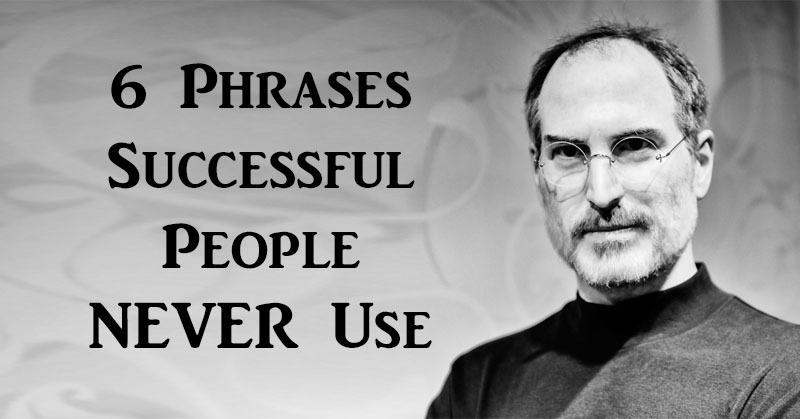 A successful person eliminates these phrases from their vocabulary. When a difficult situation arises, they get to work looking for a solution. They either remove the barrier, or they find a way to go over, under or around it. They refuse to be limited by negative thoughts. The fact is, you always have a choice. Successful people know that to be true. Those who lean on “I had no choice” are often ashamed, embarrassed or regretful of their actions. Successful people do not let others bully them into making a bad, hurtful or selfish decision. When they have a difficult choice in front of them, they carefully weigh their options and they try to make the best decision. Afterwards, they own up to their actions. A successful person knows that judgement, insults and negativity won’t get you anywhere. A successful person is grateful for the job they have, even if it’s just a step for them in climbing the ladder. They never seek to insult the company they work for, their co-workers or anyone else. Instead, they are happy to help others succeed. If they aren’t exactly where they want to be, they know that working hard will help them get there. This phrase tells others that you’re not comfortable thinking outside the box. It says that you’re stuck in your ways and unwilling to try something new. A successful person sees change as a positive thing. They are always open to learning and trying something different. The world is constantly changing. In order to be successful, you’ll have to stay caught up! Constantly evolving personally and professionally can help put you at the top of the class.